The New York Liberty will wrap up a 4-game road trip against the Phoenix Mercury on Sunday afternoon at Talking Stick Resort Arena. The Liberty is coming off a 79-70 win at Seattle on Thursday, while the Mercury have won 3-of-4, beating San Antonio, 92-77, on Friday night. New York has taken the 1st two games against Phoenix this season, winning at Talking Stick Resort Arena, 69-67, back on May 23. 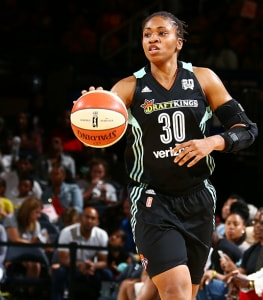 • The New York Liberty snapped a 3-game losing streak by picking up a 79-70 win at Seattle on Thursday night, winning the season-series against the Storm in the process, 2-1. After falling behind by 9 in the 1st half, New York scored 10 unanswered in the 2nd quarter to take a 1-point lead into the half, which it never relinquished. Tina Charles led the way, posting her 7th double-double of the season with 29 points and 12 rebounds, while Kia Vaughn finished with 13 points and 11 rebounds. • New York led Seattle by as many as 14 points in the 2nd half on Friday night. That was the largest lead the Liberty has held in any game since it defeated the Atlanta Dream 76-61 back on June 7 at Madison Square Garden. • Kia Vaughn has scored in double figures in back-to-back games for the 1st time this season, and posted her 1st double-double since July 29, 2014, which coincidently came against the Liberty when she was a member of the Washington Mystics. • New York has used three different starting lineups over the past four games as the team re-integrates Kia Vaughn and Epiphanny Prince after they both missed 6 games to compete in the EuroBasket Women Tournament. 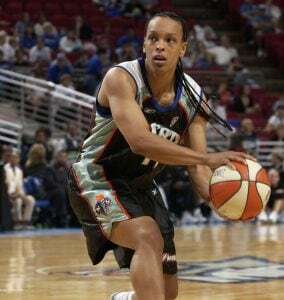 Tina Charles and Brittney Griner going head-to-head is always a showstopper, but this game will also feature two of the best deep threats in the game in Sugar Rodgers and the WNBA all-time leading scorer Diana Taurasi. Rodgers has nailed 33 3-pointers this season, good for 4th best in the league, while averaging 12.8 ppg, while Taurasi leads the league with 47 makes from downtown, while scoring 18.0 ppg. Whomever is able to provide their team with an edge on the outside will help decide the outcome of the game. New York secured a victory in the season series with the Mercury via an 88-72 win at Madison Square Garden on June 4. The Liberty jumped out to a 23-16 lead after the 1st quarter in that game and never trailed. Kiah Stokes (23 points) and Shavonte Zellous (21 points) led New York offensively, while the Liberty limited Phoenix to just 34.8 percent from the field. Brittney Griner poured in 26 for the Mercury, converting 12-of-14 at the line. Tina Charles turned in her 2nd-highest scoring output of the season, finishing with 29 points to go along with 12 rebounds for her 7th double-double of the year as the Liberty beat the Seattle Storm 79-70 on July 6. Charles shot 10-of-21 from the field, and also had 4 assists, and 3 blocked shots. 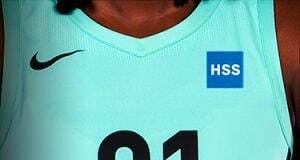 She currently ranks 3rd in the WNBA in scoring (20.3 ppg) and rebounding (9.1 rpg). Kia Vaughn posted 13 points and 11 rebounds against Seattle on July 6 to record her 1st double-double since July 29, 2014, which coincidentally came against the New York Liberty when she was a member of the Washington Mystics. She scored all 13 points of her points in the 2nd half, hitting her first 6 field goal attempts to finish 6-of-7 from the floor. It was also the 1st time she posted double-digit rebounds in a game since Aug. 5, 2015. Rookie point guard Lindsay Allen came off the bench to play nearly 16 minutes in New York’s win at Seattle on July 6. 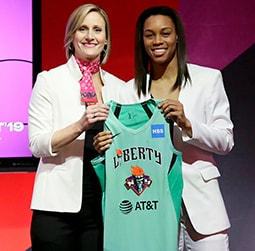 While her numbers may not have been flashy, scoring 2 points with 2 rebounds and an assist, the Liberty was +7 when she was on the court, and that has proven to be pretty important since she signed with the team on May 31. Since that time, she has posted a positive plus-minus rating 5 times in games during which she saw action, and New York is 5-0 in those cases. In the 4 games where she had a negative rating, the Liberty has gone just 1-3. Dating back to last season, the Liberty has won 3-straight regular season games at Phoenix, the longest winning streak on the road against the Mercury for New York in the history of the series. Additionally, New York has won 4 in a row overall, which ties for the longest winning streak in the series for either team, and the most consecutive wins for the Liberty against the Mercury since a stretch from 2000-2003.